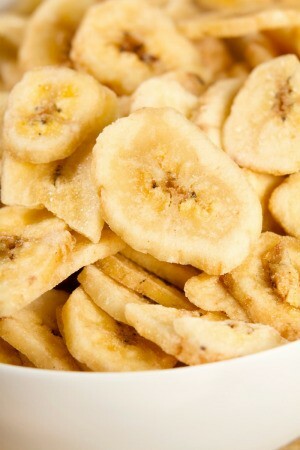 In addition to being a delicious crunchy snack, dried bananas can be used in many baking and breakfast recipes. They can also be rehydrated and used as you would a fresh banana. This page contains recipes using dried bananas. I know that using dried beans is more economical and that we should get more protein and fiber into our diets. I just haven't been able to find any recipes that actually look GOOD. Does anyone have any tried and true recipes that are tasty too? Try making them in the crock pot or pressure cooker. Know that the older the beans, the longer they take to cook. And I do mean longer. They say not to add salt when cooking in the beginning, because it supposedly toughens the beans. Why take chances? Salt 'em at the table! Clean 4 cups dried pinto beans, wash and put in slow cooker. Add water to about 1 inch from the top of the cooker. Cook on low all night. In the morning: Mix 1 chopped onion, 1 can of Rotel, 4 tsps salt,(less if you prefer), 8 slices of bacon, chopped (or chopped ham or ham bone). Heat before adding to the beans or they won't cook well if you add anything cold to them. (If using the ham bone, let it simmer all night with the beans) Add mixture to beans and turn heat to high for about 2 hours and then turn to low til noon and you have a delish dish. Take the amount of beans you want, pick them over looking for stones and beans that are cracked or broken. Rinse them very, very well until the water runs clear. Put the beans in a 'pasta pot' and cover them with around 2 inches of cold water Then (here's the weird part) please two whold HEADS of garlic in the pot. Bring to a boil and simmer until the beans are done. This is important too - if you have to add additional water, it must be boiling water. Keep a teapot on the stove with boiling water in it. One thing- the beans will cook faster with this method, although I don't know why. Keep tasting the beans and when you think they're almost done. About 20 minutes before they're done, add your vegetables so they can cook in the last 20 minutes. I use one whole bay leaf, carrots, celery, lots of onions, garlic powder, salt and pepper, ground cumin, onion powder, a fresh jalapeño (not much and I take out the seeds and the veins - these are the hot parts. Take the bay leaf out before you serve the beans. Sometimes I add chili powder, sometimes paprika. You could really use anything you wanted. I'm a vegetarian, so I don't add meat. Important - before you serve, put plenty of chopped cilantro over the top of each bowlful. To me, there's nothing like fresh cilantro! Another tip from this lady concerning cilantro: the stores sell it in big bunches (in Houston, TX anyway). Cut the amount you need after you rinse what you plan to use. Take the remainder of the cilantro, get a jar or glass, fill it with water, and put the remainder of the cilantro STEMS into the water (you don't need much water), and keep it in your refrigerator. It looks like a bunch of flowers! Cover the glass holding the cilantro with a plastic bag and make sure the plastic is secure around the glass. The cilantro will last a long time. This lady really gave me no particular recipe on how to make a bean recipe per se, but gave me this infallible way to make beans. For many, many years I used any and all hints on soaking beans before cooking them, changing the water, etc. The skins of the beans came off and floated to the top; they split in two, etc. Trust me, this is the best way and the only way I make my beans now.The beans will maintain their shape and look like they came out of a can. Here's the best part (for me anyway), the Heads of garlic prevent any 'gas' from occurring. That's right; no gas by products when you eat them. The whole heads of garlic do not impart any garlic taste at all, although I don't know why. The papery skin doesn't come off the garlic heads either. I hope you try this wonderful and quick way to make dried means. They certainly are economical and there are so many ways to make them. Good Luck from Smoochie! 2. put two whole heads of garlic, which contain several cloves of garlic, with the skins on in with the beans? 3. what amt. of cooking time does it take?